It was a special occasion for the Widows’ Lunch Club who meet at Litherland Masonic Hall as they celebrated their 25th year anniversary. The celebratory lunch meeting was an opportunity to invite all the widows within the Ormskirk and Bootle Group to get together for a complementary lunch and to enjoy the companionship of friends, accompanied by entertainment, which was subsided by the kindness of The West Lancashire Freemasons Charity (WLFC). Steve Kayne addressing the ladies. The luncheon club members were also delighted to have Steve Kayne, the Chief Executive Officer of the WLFC in attendance, along with Graham Chambers Ormskirk and Bootle Group Chairman, Derek Midgley Group Pastoral Care Officer and some of the almoners from the lodges and chapters from within the group. The afternoon started with the ladies meeting in the hall’s bar area for pre-lunch drinks, before making their way into the dining hall and once the ladies were seated, Graham welcomed the ladies to the lunch, before introducing and handing over to Steve. Steve informed the ladies about some of the ways WLFC can possibly support them and how the charity’s system works. 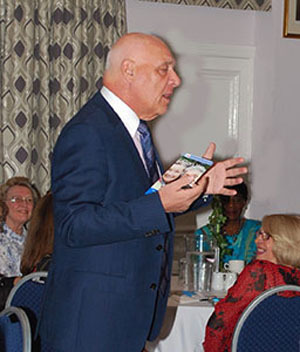 He also informed the ladies about the ‘Widows Broken Column Pin Badge’, the pin was created as an emblem to honour and also symbolise the continued concern for the widow of a brother master Mason, and after the meal each lady received a badge. Steve then handed over to Derek Midgley who explained that he was hoping the meeting would act as an incentive for another widows luncheon club to be set up at Ormskirk Masonic Hall, this would be open to widows who live in Ormskirk and the surrounding area, so that all the widows within the group will be able to meet up with friends and still feel to be a part of the group. 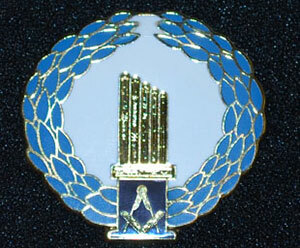 The’ Broken Column Pin Badge’. Derek then handed the proceedings over to Lynne Pyne who said grace, after which everyone was treated to an excellent two course meal. Once the meal was finished, Sue Barr gave the return of thanks for the meal. Everyone left after having had a really enjoyable time and certainly in high spirits after an afternoon with friendly company and very excellent entertainment. Pictured from left to right, are: Derek Midgley, Par Gormal, Sue Barr, Steve Kayne, Lynne Pyne, Dianne Hampson, Barbra Westby and Graham Chambers.